September 2011 Archives - Newman Dignan & Sheerar, Inc. - Providence Fee-Based Financial Advisors September 2011 Archives - Newman Dignan & Sheerar, Inc.
Weekly Commentary: Stocks & Bones? This week marks the end of the 3rd quarter and the month of September. The markets have been extremely volatile over this time period and as we mentioned previously, September has lived up to its historical position as (hopefully) the worst month of the year. Stocks continue to be whipsawed depending on the macro views of Greek default/European insolvency or the hope of a European solution. There is no doubt these extreme price changes are testing the nerves of individuals and investment professionals alike. We are not sure when the markets will calm down, however diversification has certainly helped mitigate the day-to-day swings. Falling commodity prices will help ease the strain of your wallets at the grocery store and the gas pump. Review your current mortgage rate as current interest rates have come down potentially opening the door to refinancing. Last week investors experienced volatility on the upside with the DJIA posting a 4.7% gain as concerns ebbed over the European debt crisis. Year-to-date the DJIA is down 0.6% though most people “feel” as though the markets are much lower. President Obama’s deficit reduction program which will include the “Buffet Rule” of taxing the rich. Several updates on the state of the housing industry; none of which are expected to be positive as we continue to work through excess inventories and tight credit. Over the past four months, U.S. equity funds have experienced net outflows to the tune of $75 billion. This outflow already supersedes the redemptions experienced during the months following Lehman Brother’s collapse. As this chart highlights, the average investor lets emotions dictate his decision making process and therefore continues to buy high and sell low. Take a moment, revisit your goals and time frames, and minimize such costly errors of short term emotionally driven investing. Last week the DJIA declined 2.2% again weighed down by concerns over the European debt crisis. This week the credit ratings for France’s largest private banks may be cut by Moody’s putting further downward pressure on the Euro. This week look to Thursday for reports on the CPI and industrial production for August. CPI should show some easing of inflation concerns as lower commodity prices result in a reading of +0.2% down from +0.5% in July. However, industrial production, which accounts for less than 20% of US GDP, is expected to be flat versus a +0.9% reading in July – further evidence that the U.S. economy continues to struggle with slower growth. 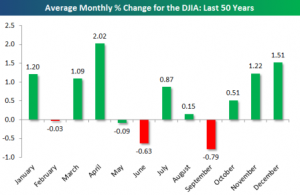 September is historically the worst month for stock returns, and this September is not off to a good start. The DJIA and the S&P 500 lost ground last week as investors grappled with spotty and conflicting economic and geopolitical news. Friday’s U.S. jobs report showed that no new net jobs were added in August. Unemployment remained at 9.1%. Businesses were reluctant to bring-on new hires due to lack of confidence in the future (regulatory overhang, lack of leadership in Washington, European sovereign debt issues, etc…). Consumers, interestingly enough, continued to spend at a decent rate during July. Consumer spending increased 0.8% in July – the fastest pace in five months. The ISM manufacturing number came in at 50.6 against an expectation of 48.5. The ISM non-manufacturing number for August came in at a better-than-expected 53.3. The ISM numbers are consistent with GDP growth of close to 2%. Talks of a recession loom large. No doubt, the odds of a recession have risen over the past month or so, but we still believe that the U.S. economy will be able to limp along while avoiding an outright recession. The good news is that the markets seem to be discounting much worse. The week ahead includes a G-7 finance meeting, a meeting of the ECB, and President Obama’s speech on jobs and deficit reduction.